Plot Synopsis: It’s been two years since the fiendish Critters first terrorized the town of Grovers Bend and sent the Brown family packing. But the “boy who called Critter,” Brad Brown (SCOTT GRIMES), is back… and just in time. Critter eggs have been hatching lethal litters, and the bloodthirsty hairballs are eager to partake in their favorite pastime – a field full of livestock becomes a gigantic feeding ground, and local residents are disappearing by the mouthful. Fortunately, three bounty hunters from space, Ug (TERRENCE MANN), Lee (RANDY SPEARS/ROXANNE KERNOHAN) and Charlie (DON OPPER), are flying back to eradicate the problem. But can they wipe out the Critters before Grovers Bend is erased from the map? Quick Hit Review: This sequel to Critters, which apparently did well enough on home video to warrant it, was actually… okay. The movie did have some of the quirky slapstick humor that I’m generally not a fan of, but the story was alright and there were certainly some fun moments, especially between the bounty hunters. Once again, the effects work and creatures design was well done as were the performances from Scott Grimes, Liane Curtis and, especially, Barry Corbin replacing M. Emmett Walsh as the town sheriff. Mick Garris takes over directing duties with a script by David Twohy, director of the Pitch Perfect trilogy and writer behind several high profile projects like The Fugitive and Waterworld. 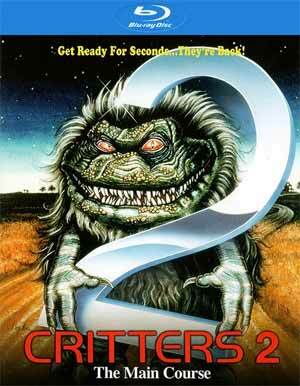 Critters 2: The Main Course might not have the magic of the first movie, but was definitely entertaining enough. Checking both of these out, these were actually a lot of fun. The Chiodo Brothers return once again and they’re rather animated and even Mick Garris, on his own, kept the flow going discussing the production, some of which was also covered in the below featurette. 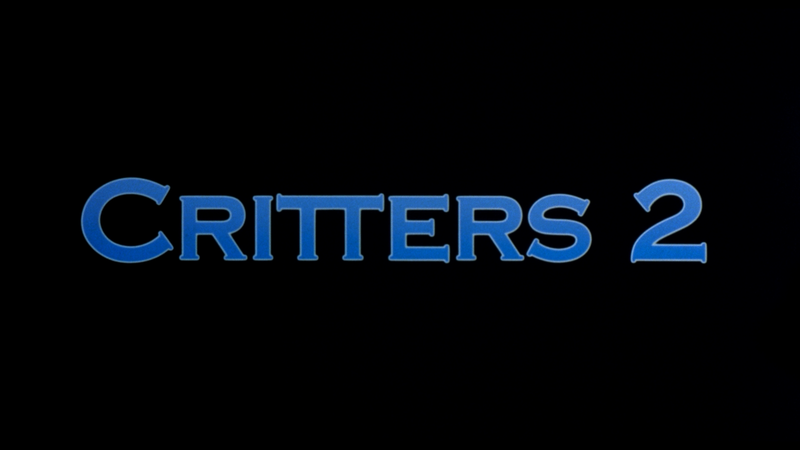 The Main Course: The Making of Critters 2 (1:03:00) features new interviews with Director Mick Garris, Actors Liane Curtis, Don Opper, Terrence Mann, and Lin Shaye, Producer Barry Opper, Critter Designers the Chiodo Brothers, and Make-Up Artist R. Christopher Biggs. This, like the one for Critters, was a great and lengthy featurette/documentary with the participants talking about the process of making the sequel, due to the first film’s success on home video. Included in there is some behind-the-scenes footage. TV Cut Additional Scenes (13:09) I presume is footage made for television airings. Behind the Scenes Footage (23:49) – As with for the first movie, this is some footage from on-set in a promotional featurette. Rounding things out is the Theatrical Trailer (1:40), a TV Spot (0:32) and a Still Gallery (3:05). Shout Factory releases Critters 2: The Main Course onto Blu-ray where it is presented in its original 1.85 widescreen aspect ratio and given a 1080p high-definition transfer. Like Critters before, this also received a new 2K scan from the original film elements. And also like the first movie, this in general did look fantastic with sharp detail throughout and bright colors that didn’t appear to be boosted or artificially pumped up. That said, there were some minor specs that appeared, however I only really too notice while preparing for this review, these were more blink or miss it kind of specs. Otherwise, I didn’t see any other major flaws, making for a well done transfer from the studio. The disc comes accompanied with a standard but still respectable DTS-HD Master Audio 2.0 track which outputs good dialogue levels and, for a stereo soundtrack, decent enough depth such as the Critter’s squeals and taunts. In addition, there were no discernible hisses or pops. 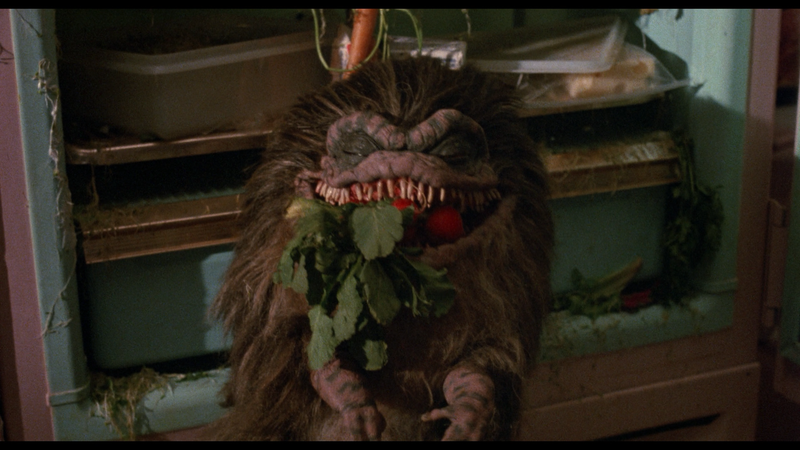 Overall, Critters 2: The Main Course might not be as good as the original, but the humor still mostly worked and I actually enjoyed the interactions between the critter bounty hunters, each of them providing a bit more personality (and seriously, wouldn’t have minded seeing some sort of spin-off). As for this Blu-ray, the video looks great, the audio well done and a nice selection of bonus features.